Pregabalin is modestly effective and is safe for treatment of generalized anxiety disorder. The World Federation of Biological Psychiatry recommends pregabalin as one of several first line agents for the treatment of generalized anxiety disorder, but recommends other agents such as SSRIs as first line treatment for obsessive–compulsive disorder and post-traumatic stress disorder. It appears to have anxiolytic effects similar to benzodiazepines with less risk of dependence. Following abrupt or rapid discontinuation of pregabalin, some people reported symptoms suggestive of physical dependence. The FDA determined that the substance dependence profile of pregabalin, as measured by a patient physical withdrawal checklist, was quantitatively less than benzodiazepines. Even people who have discontinued short term and or long term use of pregabalin have experienced withdrawal symptoms, including insomnia, headache, nausea, anxiety, diarrhea, flu like symptoms, nervousness, major depression, pain, convulsions, hyperhidrosis and dizziness. In the United States as of April 2018 the cost is US$6.29–8.39 per 150 mg capsule. It is available as a generic medication in a number of countries but not the United States as of 2018. In the US the wholesale costs is about US$450 per month as of 2019, whereas in the United Kingdom a similar dose costs the NHS about £6. In the United States, the high cost of pregabalin has prompted payer requirements for justification of the expenditure, such as necessitating other agents as first-line pain control (that is, step therapy) and prior authorization. A systematic review found that these measures "significantly decrease utilization of pregabalin, but do not consistently demonstrate cost savings for US health plans." Up until 2009, Pfizer promoted Lyrica for other uses which had not been approved by medical regulators. For Lyrica and three other drugs, Pfizer was fined a record amount of US$2.3 billion by the Department of Justice, after pleading guilty to advertising and branding "with the intent to defraud or mislead." Pfizer illegally promoted the drugs, with doctors "invited to consultant meetings, many in resort locations; attendees expenses were paid; they received a fee just for being there", according to prosecutor Michael Loucks. Pfizer's main patent for Lyrica, for seizure disorders, in the UK expired in 2013. In November 2018 the Supreme Court of the United Kingdom ruled that Pfizer's second patent on the drug, for treatment of pain, was invalid because there was a lack of evidence for the conditions it covered – central and peripheral neuropathic pain. From October 2015 GPs were forced to change patients from generic pregabalin to branded until the second patent ran out in July 2017. This cost the NHS £502 million. ^ a b c d Schifano, Fabrizio (2014). "Misuse and Abuse of Pregabalin and Gabapentin: Cause for Concern?". CNS Drugs. 28 (6): 491–6. doi:10.1007/s40263-014-0164-4. PMID 24760436. ^ "Pregabalin - Drugs.com". www.drugs.com. Retrieved 2016-11-07. ^ a b c d e f g h "Summary of product characteristics" (PDF). European Medicines Agency. 6 March 2013. Retrieved 6 May 2013. ^ "Pregabalin (Professional Patient Advice) - Drugs.com". www.drugs.com. Retrieved 2016-11-07. ^ "Pregabalin (Professional Patient Advice)". Drugs.com. ^ Hantson, P; Courtois, F; Borrey, D; Haufroid, V (2014). "Pregabalin-associated myoclonic encephalopathy without evidence of drug accumulation in a patient with acute renal failure". Indian Journal of Nephrology. 24 (1): 48–50. doi:10.4103/0971-4065.125102. PMC 3927193. PMID 24574633. ^ Randinitis, Edward J.; Posvar, Edward L.; Alvey, Christine W.; Sedman, Allen J.; Cook, Jack A.; Bockbrader, Howard N. (2003). "Pharmacokinetics of Pregabalin in Subjects with Various Degrees of Renal Function". The Journal of Clinical Pharmacology. 43 (3): 277–83. doi:10.1177/0091270003251119. PMID 12638396. ^ a b c d e f g "Pregabalin". The American Society of Health-System Pharmacists. Retrieved 3 February 2019. ^ Frampton, James E. (2014). "Pregabalin: A Review of its Use in Adults with Generalized Anxiety Disorder". CNS Drugs. 28 (9): 835–54. doi:10.1007/s40263-014-0192-0. PMID 25149863. ^ Iftikhar, IH; Alghothani, L; Trotti, LM (December 2017). "Gabapentin enacarbil, pregabalin and rotigotine are equally effective in restless legs syndrome: a comparative meta-analysis". European Journal of Neurology. 24 (12): 1446–1456. doi:10.1111/ene.13449. PMID 28888061. ^ Mishriky, B. M.; Waldron, N. H.; Habib, A. S. (January 2015). "Impact of pregabalin on acute and persistent postoperative pain: a systematic review and meta-analysis". British Journal of Anaesthesia. 114 (1): 10–31. doi:10.1093/bja/aeu293. ISSN 1471-6771. PMID 25209095. ^ "Pregabalin Use During Pregnancy". Drugs.com. Retrieved 4 February 2019. ^ a b "Generic Lyrica Availability". Drugs.com. Retrieved 4 February 2019. ^ Pulman, Jennifer; Hemming, Karla; Marson, Anthony G.; Pulman, Jennifer (2014). "Pregabalin add-on for drug-resistant partial epilepsy". The Cochrane Database of Systematic Reviews (3): CD005612. doi:10.1002/14651858.CD005612.pub3. PMC 4058599. PMID 24623260. ^ a b Zhou, Q.; Zheng, J.; Yu, L.; Jia, X. (17 October 2012). "Pregabalin monotherapy for epilepsy". The Cochrane Database of Systematic Reviews. 10: CD009429. doi:10.1002/14651858.CD009429.pub2. PMID 23076957. ^ Attal, N.; Cruccu, G.; Baron, R.; et al. (September 2010). "EFNS guidelines on the pharmacological treatment of neuropathic pain: 2010 revision". European Journal of Neurology. 17 (9): 1113–e88. doi:10.1111/j.1468-1331.2010.02999.x. PMID 20402746. ^ a b Moore, R. Andrew; Straube, Sebastian; Wiffen, Philip J.; Derry, Sheena; McQuay, Henry J.; Moore, Maura (2009). "Pregabalin for acute and chronic pain in adults". The Cochrane Database of Systematic Reviews (3): CD007076. doi:10.1002/14651858.CD007076.pub2. PMC 4167351. PMID 19588419. ^ Finnerup, N.B. ; Sindrup, S. H.; Jensen, T. S. (September 2010). "The evidence for pharmacological treatment of neuropathic pain". Pain. 150 (3): 573–81. doi:10.1016/j.pain.2010.06.019. PMID 20705215. ^ Enke, O.; New, H. A.; New, C. H.; Mathieson, S.; McLachlan, A. J.; Latimer, J.; Maher, C. G.; Lin, C. C. (3 July 2018). "Anticonvulsants in the treatment of low back pain and lumbar radicular pain: a systematic review and meta-analysis". CMAJ : Canadian Medical Association Journal = Journal de l'Association Médicale Canadienne. 190 (26): E786–E793. doi:10.1503/cmaj.171333. PMC 6028270. PMID 29970367. ^ a b Bennett, Michael I.; Laird, Barry; van Litsenburg, Chantal; Nimour, Meryem (2013). "Pregabalin for the Management of Neuropathic Pain in Adults with Cancer: A Systematic Review of the Literature". Pain Medicine. 14 (11): 1681–8. doi:10.1111/pme.12212. PMID 23915361. ^ Linde, M.; Mulleners, W. M.; Chronicle, E. P.; McCrory, D. C. (24 June 2013). "Gabapentin or pregabalin for the prophylaxis of episodic migraine in adults". The Cochrane Database of Systematic Reviews. 6 (6): CD010609. doi:10.1002/14651858.CD010609. PMID 23797675. ^ Chaparro, Luis Enrique; Smith, Shane A.; Moore, R. Andrew; Wiffen, Philip J.; Gilron, Ian (2013). "Pharmacotherapy for the prevention of chronic pain after surgery in adults". The Cochrane Database of Systematic Reviews (7): CD008307. doi:10.1002/14651858.CD008307.pub2. PMID 23881791. ^ Hamilton, T. W.; Strickland, L. H.; Pandit, H. G. (17 August 2016). "A Meta-Analysis on the Use of Gabapentinoids for the Treatment of Acute Postoperative Pain Following Total Knee Arthroplasty". The Journal of Bone and Joint Surgery, American Volume. 98 (16): 1340–50. doi:10.2106/jbjs.15.01202. PMID 27535436. ^ Patel, Ryan; Dickenson, Anthony H. (2016). "Mechanisms of the gabapentinoids and α2δ-1 calcium channel subunit in neuropathic pain". Pharmacology Research & Perspectives. 4 (2): e00205. doi:10.1002/prp2.205. PMC 4804325. PMID 27069626. ^ Slee A, Nazareth I, Bondaronek P, Liu Y, Cheng Z, Freemantle N (February 2019). "Pharmacological treatments for generalised anxiety disorder: a systematic review and network meta-analysis". Lancet. 393 (10173): 768–777. doi:10.1016/S0140-6736(18)31793-8. PMID 30712879. ^ Owen, Richard T. (September 2007). "Pregabalin: its efficacy, safety and tolerability profile in generalized anxiety". Drugs of Today. 43 (9): 601–10. doi:10.1358/dot.2007.43.9.1133188. PMID 17940637. ^ Bandelow, B.; Sher, L.; Bunevicius, R.; et al. (June 2012). "Guidelines for the pharmacological treatment of anxiety disorders, obsessive-compulsive disorder and posttraumatic stress disorder in primary care". International Journal of Psychiatry in Clinical Practice. 16 (2): 77–84. doi:10.3109/13651501.2012.667114. PMID 22540422. ^ a b c d Bandelow, Borwin; Wedekind, Dirk; Leon, Teresa (2007). "Pregabalin for the treatment of generalized anxiety disorder: a novel pharmacologic intervention". Expert Review of Neurotherapeutics. 7 (7): 769–81. doi:10.1586/14737175.7.7.769. PMID 17610384. ^ Shanthanna, Harsha; Gilron, Ian; Rajarathinam, Manikandan; AlAmri, Rizq; Kamath, Sriganesh; Thabane, Lehana; Devereaux, Philip J.; Bhandari, Mohit; Tsai, Alexander C. (15 August 2017). "Benefits and safety of gabapentinoids in chronic low back pain: A systematic review and meta-analysis of randomized controlled trials". PLOS Medicine. 14 (8): e1002369. doi:10.1371/journal.pmed.1002369. PMC 5557428. PMID 28809936. ^ Mannix, Liam (18 December 2018). "This popular drug is linked to addiction and suicide. Why do doctors keep prescribing it?". The Canberra Times. Retrieved 18 December 2018. ^ Freynhagen, R.; Backonja, M.; Schug, S.; Lyndon, G.; Parsons, B.; Watt, S.; Behar, R. (December 2016). "Pregabalin for the Treatment of Drug and Alcohol Withdrawal Symptoms: A Comprehensive Review". CNS Drugs. 30 (12): 1191–1200. doi:10.1007/s40263-016-0390-z. PMC 5124051. PMID 27848217. ^ Onakpoya IJ, Thomas ET, Lee JJ, Goldacre B, Heneghan CJ (January 2019). "Benefits and harms of pregabalin in the management of neuropathic pain: a rapid review and meta-analysis of randomised clinical trials". BMJ Open. 9 (1): e023600. doi:10.1136/bmjopen-2018-023600. PMC 6347863. PMID 30670513. ^ a b c Drug Enforcement Administration, Department of Justice (July 2005). "Schedules of controlled substances: placement of pregabalin into schedule V. Final rule". Federal Register. 70 (144): 43633–5. PMID 16050051. Retrieved 2012-01-22. ^ "Pregabalin Pregnancy and Breastfeeding Warnings". Retrieved 29 August 2016. ^ Murphy, N. G.; Mosher, L. (2008). "Severe myoclonus from pregabalin (Lyrica) due to chronic renal insufficiency". Clinical Toxicology. 46 (7): 594. doi:10.1080/15563650802255033. ^ Yoo, Lawrence; Matalon, Daniel; Hoffman, Robert S.; Goldfarb, David S. (2009). "Treatment of pregabalin toxicity by hemodialysis in a patient with kidney failure". American Journal of Kidney Diseases. 54 (6): 1127–30. doi:10.1053/j.ajkd.2009.04.014. PMID 19493601. ^ a b c Bryans, Justin S.; Wustrow, David J. (1999). 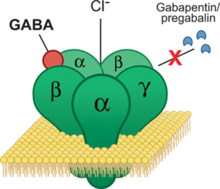 "3-Substituted GABA analogs with central nervous system activity: A review". Medicinal Research Reviews. 19 (2): 149–77. doi:10.1002/(SICI)1098-1128(199903)19:2<149::AID-MED3>3.0.CO;2-B. PMID 10189176. ^ Arora, Mahesh Kumar; Agarwal, Anil; Baidya, Dalim Kumar; Khanna, Puneet (2011). "Pregabalin in acute and chronic pain". Journal of Anaesthesiology Clinical Pharmacology. 27 (3): 307–14. doi:10.4103/0970-9185.83672. PMC 3161452. PMID 21897498. ^ McMahon, Stephen B. (2013). Wall and Melzack's textbook of pain (6th ed.). Philadelphia, PA: Elsevier/Saunders. p. 515. ISBN 9780702040597. ^ a b Lauria-Horner, Bianca A.; Pohl, Robert B. (2003). "Pregabalin: a new anxiolytic". Expert Opinion on Investigational Drugs. 12 (4): 663–72. doi:10.1517/13543784.12.4.663. PMID 12665421. ^ "LYRICA – pregabalin capsule". DailyMed. U.S. National Library of Medicine. September 2010. Retrieved 6 May 2013. ^ Wyllie, Elaine; Cascino, Gregory D.; Gidal, Barry E.; Goodkin, Howard P. (17 February 2012). Wyllie's Treatment of Epilepsy: Principles and Practice. Lippincott Williams & Wilkins. p. 423. ISBN 978-1-4511-5348-4. ^ Lowe, Derek. "Getting to Lyrica". In the Pipeline. Science. Retrieved 21 November 2015. ^ a b Merrill, Nick (25 February 2010). "Silverman's golden drug makes him NU's golden ticket". North by Northwestern. Retrieved 19 May 2016. ^ Andruszkiewicz, Ryszard; Silverman, Richard B. (1990). "4-Amino-3-alkylbutanoic acids as substrates for gamma-aminobutyric acid aminotransferase". The Journal of Biological Chemistry. 265 (36): 22288–91. PMID 2266125. ^ Poros, Joanna (2005). "Polish scientist is the co-author of a new anti-epileptic drug". Science and Scholarship in Poland. Archived from the original on August 20, 2016. Retrieved May 19, 2016. ^ Dworkin, Robert H.; Kirkpatrick, Peter (2005). "Pregabalin". Nature Reviews Drug Discovery. 4 (6): 455–6. doi:10.1038/nrd1756. PMID 15959952. ^ "LYRICA® CR (Pregabalin) Tablets CV | Home Page | Official HCP Site". www.pfizerpro.com. Retrieved 2018-10-03. ^ Editorial, Reuters. "BRIEF-FDA approves Pfizer's Lyrica® CR extended-release tablets CV". U.S. Retrieved 2018-10-03. ^ "Lyrica Price". Retrieved 3 May 2018. ^ a b Stacey, BR; Liss, J; et al. (2017), "A systematic review of the effectiveness of policies restricting access to pregabalin", BMC Health Serv Res, 17 (1): 600, doi:10.1186/s12913-017-2503-x, PMID 28841868. ^ "Lyrica – FDA prescribing information, side effects and uses". ^ Drug Enforcement Administration, Department of Justice (July 2005). "Schedules of controlled substances: placement of pregabalin into schedule V. Final rule". Federal Register. 70 (144): 43633–43635. PMID 16050051. ^ "Title 21 CFR – PART 1308 – Section 1308.15 Schedule V". usdoj.gov. ^ Felleskatalogen (7 May 2015). "Lyrica". felleskatalogen.no. ^ Chalabianloo, F.; Schjøtt, J. (January 2009). "Pregabalin and its potential for abuse". Journal of the Norwegian Medical Association. 129 (3): 186–187. doi:10.4045/tidsskr.08.0047. PMID 19180163. ^ "Re: Pregabalin and Gabapentin advice" (PDF). GOV.UK. 14 January 2016. ^ Mayor, Susan (2018-10-16). "Pregabalin and gabapentin become controlled drugs to cut deaths from misuse". British Medical Journal. 363: k4364. doi:10.1136/bmj.k4364. ISSN 0959-8138. PMID 30327316. ^ "Pfizer to pay $2.3 billion to resolve criminal and civil health care liability relating to fraudulent marketing and the payment of kickbacks". Stop Medicare Fraud, U.S. Departments of Health & Human Services, and of Justice. Archived from the original on August 30, 2012. Retrieved July 4, 2012. ^ a b "Pfizer Pays $2.3 Billion to Settle Marketing Case". New York Times. Retrieved 21 December 2017. ^ a b "Pfizer agrees record fraud fine". BBC News. 2 September 2009. Retrieved 21 December 2017. ^ "Portions of the Pfizer Inc. 2010 Financial Report". U.S. Securities and Exchange Commission. 2010. Retrieved 21 December 2017. ^ Jacoby, M. (2008). "Financial Windfall from Lyrica". Chemical & Engineering News. 86 (10): 56–61. doi:10.1021/cen-v086n010.p056. ^ "Patent US6197819 – Gamma amino butyric acid analogs and optical isomers". ^ "Decision: Pfizer Inc. (PFE) v. Teva Pharmaceuticals USA Inc., 12-1576, U.S. Court of Appeals for the Federal Circuit (Washington)" (PDF). ^ a b "Pregabalin international brands". Drugs.com. Retrieved 27 October 2017. ^ "Pfizer's failed pregabalin patent appeal means NHS could reclaim £502m". Pulse. 14 November 2018. Retrieved 15 November 2018.